I don't know about you, but I am the STRESS queen. I stress all the time, every day, all day. I make lists, and rarely get things crossed off because I spend most of my time stressing about stress which then makes me more stressed. and who knows? Maybe it will help you de-stress. Lord knows I need all the help I can get right now in this department. This is quoted exactly from the article btw. Get up twenty minutes earlier than usual. Hope this helps all of you stressed out lovelies. All good things to do! I am the biggest "Stress-meister" ever. Thanks for the list!! When you actually analyze this list, you realize that by doing just some of theses things, you could actually make life easier! Great post! Hope you enter my give away! 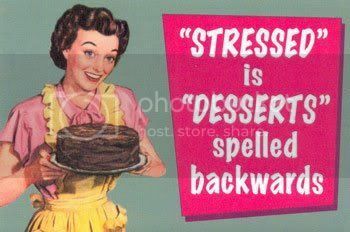 I need to remember these de-stress hints!! I feel like even when there's more than enough time to get things done, I don't feel like I've accomplished enough.